Mathalia graduated from Big Sky High School in Missoula, Montana on June 1, 2013. She was born with Down Syndrome which is certainly part of who she is but it doesn’t define her as a person. She had an amazingly full Senior Year: swimming on the high school swim team, working on her Senior project, playing violin for her high school orchestra, volunteering at Missoula Children’s Theater, keeping up with her small pot holder business and new this year: joining FFA (Future Farmers of America) learning how to take care of chickens, a lamb and and a goat. Mathalia’s mom, Janet, reared Mathalia with the philosophy that if the older children, Morielle and Matthan, were doing something, then Mathalia should be given the chance to try without any expectations as to outcomes, just to have the experience. When Morielle wanted to join the swim team, Janet asked: what would it take for Mathalia to be on the swim team? Well, she had to be able to swim across the Grizzly Pool on her own. Okay, that meant private swim lessons for about a year in third grade; then her teacher swam with her during swim team practice for about a month or so and then Mathalia was on the swim team! She swam with Missoula Aquatic Club through her Senior Year and she swam for her high school all for years. The team gave her a Letterman Jacket at her Senior Swim Banquet to express appreciation for Mathalia’s hard work and the joy she brought to practice every morning at 5:30. The older children were both studying violin so Janet enrolled Mathalia in Kindermusik classes and then in first grade, Mathalia started to study the violin. She will continue taking lessons with her private teacher in her adult life. She loved playing with her high school orchestra for three years. Also in high school Mathalia enjoyed studying art all for years and started FFA her Senior Year. She studied livestock judging, meats judging and is learning to take care of animals and will show one at the Western Montana Fair in August. Mathalia’s business had an unremarkable beginning: Janet wanted something to give to Mathalia’s preschool teachers for Christmas AND she wanted to keep it simple and keep it from Mathalia. She rummaged around her attic and found pot holder looms and lots of loopers that the older children had lost interest in. Whala! 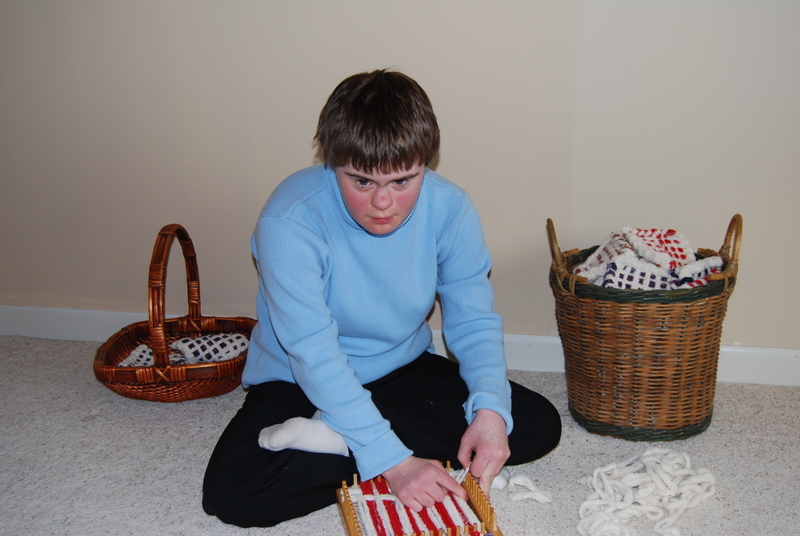 She sat Mathalia down, put her hands on her hands and started making pot holders. Soon Mathalia was putting the loopers on the loom by herself; then Janet would just hold the loopers apart for Mathalia to weave under-over-under-over; with colored loopers in-between cream colored loopers it did not take Mathalia long to start weaving on her own. The surprise was when Mathalia took the crochet hook out of her mom’s hand to take the pot holder off the loom all by herself! A friend offered to sell them in her shop as a favor thinking that the demand would slow and then stop within a year or so. Not so! 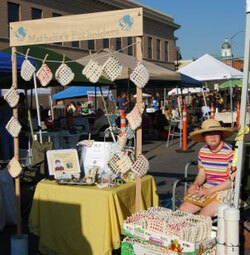 The demand never abated and other shops were suggested and now Mathalia sells potholders at seven locations in Missoula and at the University Art Fairs and frequently at Missoula Saturday Market. For her Senior Project she learned to weave on a four harness floor loom, Australian Locker Hooking and spinning fleece into yarn. As she begins her adult life, Mathalia is open to the possibilities of growth and expansion. She finds making the potholders very relaxing and is currently churning them out faster than she can sell them. Mathalia’s future is uncertain; her parents have not ruled out college. 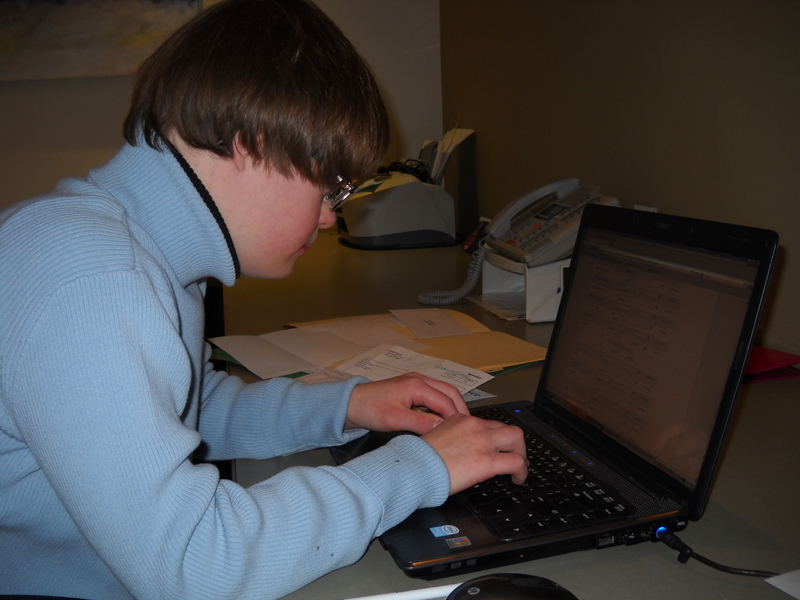 Shepherd’s College, the country’s leading post-secondary educational program for students with intellectual disabilities, may be a good fit for Mathalia. Or she may stay in Missoula and continue to explore new opportunities. Attending college or not, Mathalia’s parents are committed to helping Mathalia achieve her potential and live as independently as possible. Mathalia currently works at The Writing Center at The University of Montana doing data entry. She has other volunteer and non-paid work experiences around Missoula. She is a very meticulous and accurate worker and she hopes to pursue a career in a field that uses her skills. If you’re interested in keeping up with Mathalia’s vocational, athletic, theatrical, and musical pursuits, you can follow her blog by clicking the “follow” button on the top right of this website. Mathalia made the following 5 minute video to share at her Senior Swim Banquet. She chose the photos, wrote the captions and selected the music. Enjoy! I am an adult. Big Sky High School is all done! I like to see Big Sky friends on campus or around Missoula.